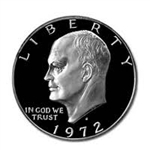 Eisenhower Dollars were struck to commemorate Dwight D. Eisenhower, who died in 1969, and the Apollo 11 moon landing of the same year. It was annually minted for only eight years. Special Bicentennial issues were minted in 1975 and 1976. Although once considered a marginal set to collect, Eisenhower dollars have significantly gained in popularity with collectors in recent years. 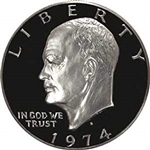 In part, this is due to the large size of the coin and the fact that a complete set of high-grade Eisenhower Dollars can be obtained for a modest price.